I’ll be honest: I'm a bit over zombies. Zombie films, fiction and even TV programmes have enjoyed huge popularity in recent years, and although there have been plenty of interesting reinventions of the genre, I do feel like I’ve read and seen it all. 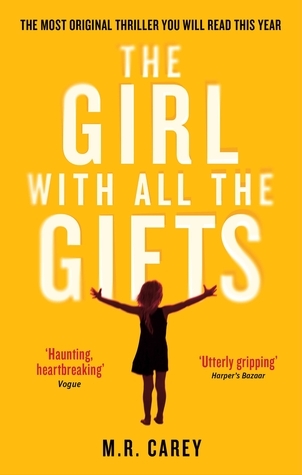 That made me a little bit reluctant to pick up MR Carey’s critically acclaimed bestseller The Girl With All The Gifts, but as critics have rightly pointed out, there is more to this book than the walking dead. The Girl With All The Gifts opens with Melanie, an exceptionally gifted 10-year-old, being taken for lessons with the rest of her class, all of whom live in bare cells with a single picture attached to the wall with mysteriously scarce Blu-Tack. When they’re taken to their classroom, they’re strapped into chairs at gunpoint by soldiers. And the few people allowed contact with them are doused in bitter chemicals that block their human scent. Melanie and her classmates, then, are not like other children – but crucially, neither are they like the infected, cannibalistic zombies, or ‘hungries’ who have overrun the country. Somehow, Melanie has retained not only sentience but also a startling intellect, despite the infection, and this makes her immensely valuable to what little remains of the government. This naturally raises all sorts of interesting questions and moral dilemmas, all of which are played out through the interactions of the the small band of characters forced together by an incident that occurs relatively early on in the story. At the heart of the novel there is the intense and deeply touching bond between Melanie and her teacher, Miss Justineau, whose kindness and humanity stands out to such a degree that Melanie – with no other parental figure in her life – develops an unshakeable, charmingly uncomplicated love and admiration. But there’s also Sergeant Parks, an aggressive man hardened to the point of cruelty by horrific experiences and the immense burden of responsibility, and Caroline Caldwell, the research scientist whose one great goal is to find out exactly what’s going on in Melanie’s infected brain. Finally, there’s Private Gallagher, who doesn’t even remember life before ‘breakdown’, and is barely more than a boy himself. I’ve seen others suggest that this ‘isn’t really a horror novel'. I would disagree; I think it absolutely is. Post-Breakdown Britain has all the hallmarks of a horror fiction post-apocalyptic dystopia, the primary plot is one of survival and there is plenty of high-octane zombie action; there are also many scenes which are extremely grisly. It’s more accurate to say that it isn’t only a horror novel, and the tenderness within it is beautifully well-executed and appealing. The characters themselves are mostly very well-drawn, and develop convincingly, even when they take an unexpected turn - my favourite character by the end of the book was not the person I thought it would be at the start, and almost felt like an unexpected bonus bestowed upon us by the author. The only character I felt was a little two-dimensional was Dr Caldwell, who did tip over, Frankenstein-style, into the stereotype of the scientist driven mad by a desire for discovery and greatness. However, the moral question raised by her story arc is a complex one, and her presence in the novel would be valuable even for this alone. Miss Justineau is a delight, but despite Melanie’s hero-worship of her, remains fallible and realistic throughout. Melanie herself, who as a precocious ten-year-old could easily have been irritating company, has a determination and loyalty about her that is charming and uncomplicated. At the same time, despite her love of Miss Justineau becoming her driving force for most of the novel, Melanie also has a pragmatic rationalism that counterpoints her fundamentally sweet nature. This is a book about a civilisation in its gruesome death throes, and in that regard, it does have a bleakness about it and there are times when the horror seems as if it will become relentless. There is also, however, a thread of hope and redemption that runs throughout the story, and an overall it’s a far more optimistic read than you’d expect, given the subject matter. It is, to use a cliché, an emotional rollercoaster, with moments of gentle melancholy, heart-pounding horror, intense sadness and humour borne of both darkness and innocence.